San Francisco is defintely #1 on my travel list for the United States. I feel like I would love the city so much. It's by the water and so beautiful. I think I am more of a Northern California person rather than SoCal. Plus, the Giants are my number two team in the National League. I am not sure how I feel about all the hills, but hopefully if I visit, I can get past that. I've done two other posts like this before. There is Santorini and Paris and now San Francisco! To me, laidback and simple seems like the perfect aesthetic for San Francisco. 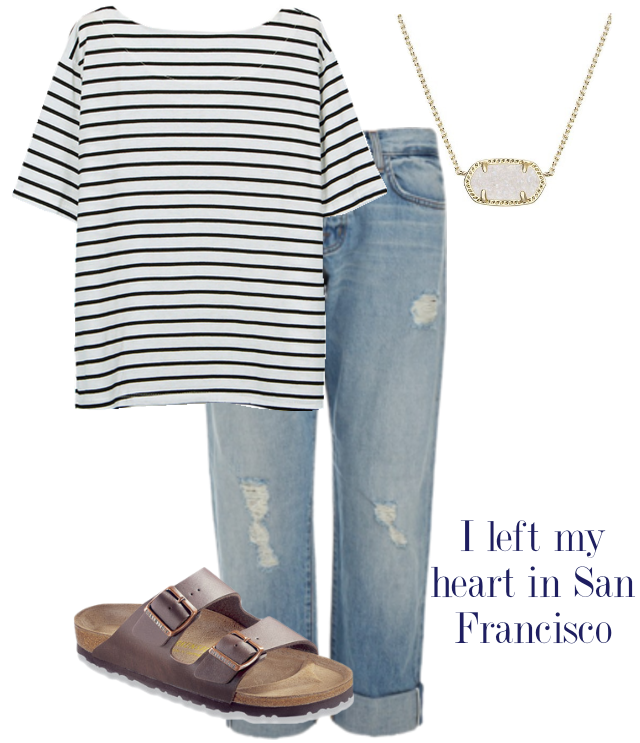 Pairing Birkenstocks with ripped boyfriend jeans and a loose t-shirt is just right. I know it can get cold on the Bay when it is night, so you could definitely add one of those opened sweaters to keep you warm or even an oversized flannel, which is more hipster.